I've spent more than half my life in Pennsylvania. But Ohio was my home from 1947 to 1974, and for the final 3½ years of that period, I was part of the newborn television industry in the medium-sized Ohio city of Marion. Elsewhere on this website, I've excerpted my letters from the Marion years. Click here to read them and to see the pictures. But there are a handful of stories that didn't make it into my letters. In 2002, I wrote some of them up for a proposed monthly column on a Marion website. Here are those tales of local TV shows in the 1970s. 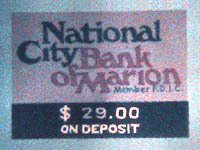 In the early Seventies, Marion actually had its own television "station." 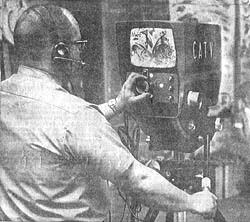 The local cable TV system, then known as Marion CATV, produced shows in a small studio at 196 South Main Street and occasionally televised events from as far away as Columbus. 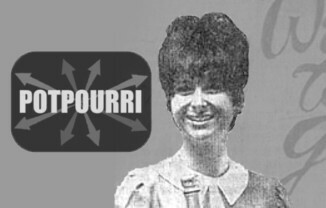 The programs were seen daily, in black and white, on channel 3. And I helped make it happen, until the time came for the plug to be pulled. TV-3 debuted on June 1, 1970. These pictures were part of a full-page ad and a full-page story that appeared during the previous month in the Marion Star. At the left, chief technician Cliff Dice turns the focusing knob on one of the cameras. Zooming was accomplished by pushing or pulling this same knob. At least the viewfinder had a big picture. 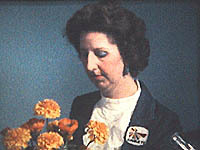 Backdrops for various programs were painted on oversized window blinds, which could be rolled up for quick scene changes. 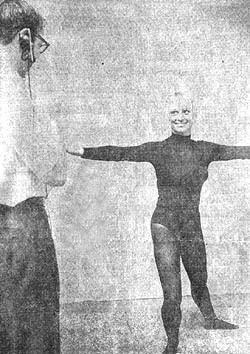 Among the first offerings were several short programs for women with Mary Ann Stolarczyk (at right) . . .
. . . and Nancy Fisher, here rehearsing her daily exercise show Measuring Up with technician Art Plantz looking on. John Hoffman analyzed handwriting on a 15-minute weekly program. 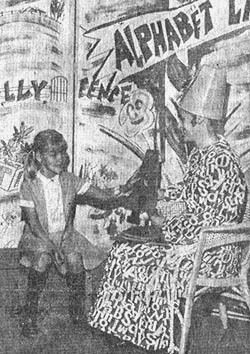 There was a kids' show (at right), with a costumed Linda Davis portraying teacher Jolly Jingles in Alphabet Land. 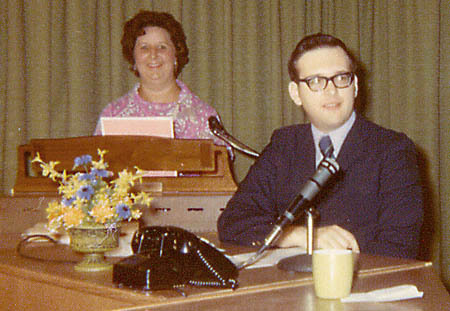 And there was a 15-minute evening newscast, first with Terry Van Dyke, then with John Snyder, and finally, starting in September of 1970, with me. 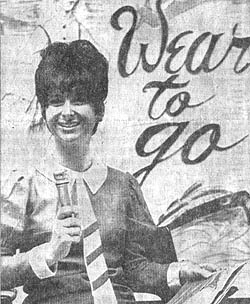 Soon Columbus TV pioneer Sally Flowers had a daily hour. After five months, this morning talk show was turned over to home-grown hostesses and became Marion Today. Later we added bingo, movies from the 1930s and 1940s, gospel and country and rock music half-hours, telephone talk shows. 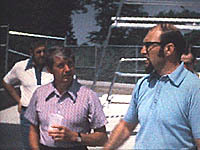 One program was hosted by the sheriff of Marion County, first Max Ross and then Richwood native Ron Scheiderer (left). High school coaches would bring in their game films. If a local basketball team had a good run in the state tournament, we'd go there to tape their games. Why did Marion CATV do all this? At first, local programming was an FCC requirement. Also, our parent company wanted to win lucrative cable franchises in other cities, and one way to impress the politicians there was to show them what we were already doing in Marion. However, CATV didn't want to absorb all the programming costs or raise the rates on subscribers' monthly cable bills. We tried to make TV-3 self-supporting by selling advertising, mostly to local merchants, but it was tough to balance the budget. Do you know how much Regis Philbin makes for hosting a live hour every morning? I don't either. But I do know that the same job in Marion paid only $8 per show. We cut costs as much as we could, using cheap equipment and doubling up on our duties. On the revenue side of the ledger, we couldn't charge much for the advertising we ran. The networks get megabucks for a Super Bowl commercial, seen by millions of people; but our commercials were seen in (at most) a few hundred homes, so they were worth only a few dollars. And our technical quality was far below the networks, so the ads weren't easy to sell. All that we had going for us was the local content. Eventually, we had to give up. 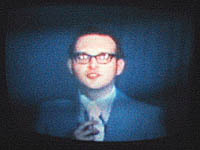 I found another job in Pennsylvania, and TV-3 shut down on February 22, 1974. But I still have memories of that "one brief shining moment" in Marion, and I'll be sharing some of those stories in this column in the coming months. When there's a local TV channel, there will be folks who want to be on it. Back in 1972, one such group was the five-piece Marion rock band Jason and Friends, who had their very own weekly half-hour on Marion CATV. The show was part music and part talk. Jason and his group would play several songs, but in the middle of the show they put down their guitars and conversed in a 15-minute "rap session." Once, they were seated for the whole show and talked between songs, sort of like the 1968 Elvis "comeback special" but without a live audience. We taped each Tuesday afternoon in the TV-3 studio. I was the director, and two of our cable installers, Gene Woy and Terry Everly, came in to operate the cameras. Then the show aired on Wednesday evening. Of course, we were dealing with musicians, so things didn't always run smoothly. I still have some of my weekly reports from the fall of 1972. On November 14, we had to postpone the taping until Wednesday afternoon because "the band's equipment is locked up in the Welcome Inn, and no one with a key is available." On November 21, there was another one-day postponement because "we just aren't prepared." On November 28, the lead guitar player never showed up, and we had to re-run a show from October. Finally, a few days before Christmas, I reported, "No taping of Jason and Friends today. Jason submitted his resignation, citing (among other reasons) a 'lack of co-operation' from members of his group. Their whereabouts today is unknown." But I still have one souvenir, in the form of a reel of Super-8 home movie film. A few months earlier, Jason had wanted to make a music video, so he borrowed my movie camera to shoot a short film of the band, to run while one of their more popular songs played: their cover of Simon and Garfunkel's "Bridge Over Troubled Water." The film consisted of one long uninterrupted take. The scene is out in the country on a beautiful sunny, breezy day. 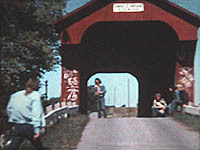 The camera is standing in the middle of a township road that leads to the Swartz covered bridge, built in 1880. Jason drives up in his white sports car and parks it at the edge of a cornfield. 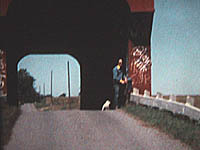 Strolling to the near end of the covered bridge, where a little white dog greets him, he puts one foot up on the guardrail and gazes out over the fields. "When you're weary, feelin' small . . ."
Then, one by one, the other four members of the band arrive on foot. A couple of them literally come out of the woodwork, emerging from hiding places in the bridge's interior shadows. "All your dreams are on their way . 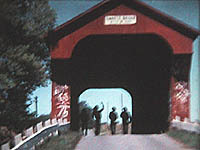 . ."
Once everyone has gathered, they turn away from the camera and casually walk through the bridge. We see their shadowed silhouettes with the sunlit road and fields beyond. "If you need a friend, I'm sailing right behind . . ."
When they reach the other side, they pause, perhaps wondering what to do next. 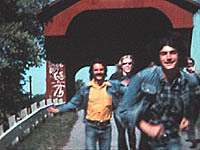 Then they turn toward us and run with wild abandon back through the bridge and past the camera, grinning, their long hair flying. I didn't completely understand the ending, but it was art. Jay Leno has his Kevin Eubanks. David Letterman has his Paul Shaffer. Johnny Carson had his Doc Severinsen. Every talk show needs a bandleader to provide the show's music and to banter with the host. 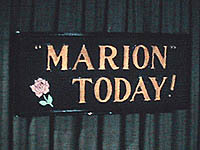 Our morning show Marion Today, which ran until 1974 on cable channel 3, had a small budget. Our music came from a band of one. At the end of the run, pianist Helen McWilliams was the one. Before Helen, there was another pianist, Richard Coleman as I recall, who played jazz. Co-hostess Sandy Park would sometimes turn to him and request in a sentimental tone, "Play 'Misty' for me." 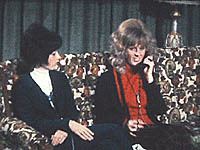 But back when Marion Today began in 1971, the show was hosted by DaLee Mounts (left), with music by Judy Dendinger (right). 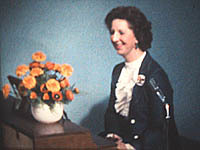 Judy played piano and organ by ear; she could hear a new song one day and play it on the show the next morning. And she had a slightly offbeat sense of humor. Once she sent me a get-well card. "Your absence was quite noticeable this morning, which proves no one is really indispensable! Hurry back, well and strong! (Did I say that right? Not indispensable. Anyway, what I mean is, everybody has their job and while the show goes on, a person is still missed. Understand? If you do, you can explain it to me.)" The instrument that she played was furnished by the Marion Piano Company. They sent it over in exchange for advertising: it was demonstrated on television several times every morning. Sometimes they sent us a piano, sometimes an electronic organ. On the set of Marion Today in 1971. 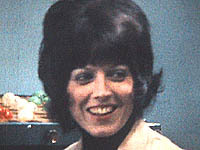 Judy Dendinger is at the organ. On this particular morning, I'm substituting for DaLee behind the desk. Early on, we had one of those newfangled organs with special buttons for preprogrammed rhythms and chord patterns. Judy quickly mastered the special buttons. She could start the organ playing a rhythm and then just sit there with her hands folded while it performed by itself. "Judy, how are you doing that?" DaLee would ask. "Well, you see," Judy would explain with a smile, "there's a little man in the organ who plays the drums. I don't have to do a thing." After a few days of references to the "little man," an idea occurred to one of our cable technicians, Art Plantz. He and I secretly put a small speaker inside the desk next to the organ. Then when the show started, Art took a microphone into our photographic darkroom and hid there, while I took my usual position in the control room. DaLee was talking to our viewers about something when she heard a small voice. "Let me out of here!" it said. She looked questioningly towards me. I shrugged, all innocence. She continued talking. There was the voice again: "Hey! Let me out of here!" "Judy, what is that?" she asked. Judy had no idea. Then we heard the voice again: "Help, let me out of here! I'm the little man in the organ!" But they refused to let him out. I think Art may still be trapped in the darkroom. 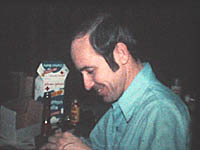 When I started working at Marion CATV in 1970, our chief technician was Clifford Dice. But we all had to wear multiple hats, and it wasn't long before Cliff was drafted as a TV star. 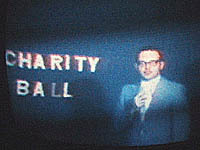 From the start of local programming in Marion, one of our offerings had been a sort of viewer-participation game show called Bowling for Dollars. 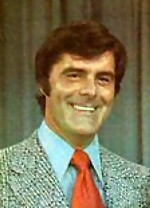 This bore only a slight resemblance to the big-bucks show of the same name hosted by Nick Perry in Pittsburgh, which reportedly drew a larger audience than its competition, the nightly network news. Marion's Bowling for Dollars was only 10 minutes long at first. Cablecast in the late afternoon five days a week, it soon expanded to 15 minutes. Viewers would mail in their entries, each with a guess of how many pins our bowler would knock down with a single ball. At one point, I was the host. My contribution was a cardboard tabletop sign that displayed the amount of the jackpot, say $13. Then I passed the torch to Cliff. Three times during the show, Cliff drew an entry from a glass fishbowl, announced the guess, and cued the bowler to do his thing. If the guess was correct, the jackpot went to the lucky viewer, but otherwise it went up by a dollar. However, our studio was not big enough for a real bowling lane. Instead, the company that packaged this program had sent us eleven little reels of 16-millimeter film. Each numbered reel, from 0 to 10, contained a ten-second clip of an anonymous bowler rolling the ball and knocking down that number of pins, from a gutter ball to a strike. The film was black and white, of course, and didn't even have a sound track. Before each show, we'd randomly choose three numbers. In the control room, I'd thread the projector with the film clip that corresponded to the first number. When Cliff gave the cue, I'd roll the film, and Cliff would narrate the action. Ten times out of eleven, he'd end by commiserating with the viewer whose guess had proven incorrect. Then he'd add a buck to the jackpot, explain the rules, and maybe do a commercial while I threaded up the next film. For practical reasons, we taped these shows in advance. Unfortunately, we used rather balky Ampex one-inch videotape recorders (not the "C Type" that would become the professional standard in the 1980s, but an earlier, inferior format). The video head would clog, and as there was no confidence head or RF meter, we had no way of knowing that no signal was actually being recorded onto the tape. We tried to record the show simultaneously on both of our machines at once. Only after we'd finished would we rewind the tapes and discover that neither one was usable. Part or all of each tape contained nothing but "snow." We had no choice but to do it all over again. Since we'd already declared winners and losers, at least in the studio, we decided that the fairest way was to make Take Two of the show come out the same way as Take One. I cued up the same films and Cliff pretended to draw the same entries from the fishbowl. Three ten-second film clips don't fill up much of a 15-minute show, so we resorted to other distractions. Cliff got a stuffed mascot that the viewers named Herkimer. I played weird sound effects through the studio speakers. Once I took the turntable out of gear while it was playing "It's Not Easy Being Green" and piped to the speakers Kermit's voice falling in pitch as he sang about "the stars iinn ttthhhee ssssskkkkkyyyyyy." Cliff did his best to react to all the foolishness in an entertaining way. But before long, he quit to earn a more respectable living as a teacher  here he is nowadays at the Sylvan Learning Center  and our scratchy bowling films were retired. Our parent company, Rustcraft Cable Communications, wanted to establish cable TV systems in other cities as well, including Anderson, Indiana. We needed to bolster our bid for the Anderson franchise, so our Marion manager Jack Rubins traveled to Cleveland and borrowed a $7500 color camera and a video-tape recorder. 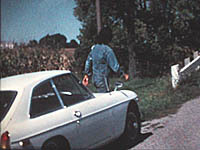 We would use them on Saturday, May 8, 1971, to record a video to be shown to officials in Anderson the following Monday. 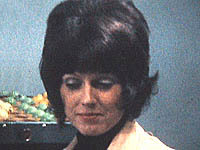 Marion was somewhat similar to Anderson. Our population was almost 40,000, while they had 70,000. We were 50 miles from our state capital, while they were 35 miles from theirs. Our residents often watched the 50-50 Club, a noontime talk show telecast from Cincinnati; so did theirs. The video we were putting together would include segments by Marion's personalities. All of us pointed out the value of local TV, as in, "It's no longer necessary to get all your television programs from the national networks or Cincinnati or the state capital. Just award Rustcraft the franchise for Anderson, and we'll built you a studio right there! Your local citizens can be on the air every day!" 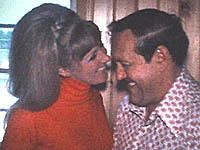 Bob Braun was well known in both Ohio and Indiana. 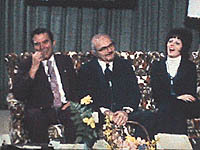 He had appeared on the 50-50 Club since 1957, and when Ruth Lyons retired in 1967, he became the host. He was going to be in Marion that weekend in May, and Jack arranged for him to come to the TV-3 studio and record a segment with our own talk host, Mary Ann Stolarczyk. Our usual video tape equipment in Marion lacked editing capability, but the borrowed VTR could do edits. On the other hand, we usually used two black-and-white cameras, but we'd borrowed only one for color. From my schooling at Syracuse the year before, I was familiar with the concepts of assemble and insert editing, so I realized I could make the Bob Braun segment look like we had two color cameras. 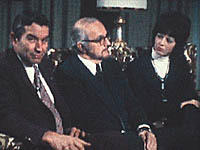 After we'd finished taping the interview  two-shot of both people, push in on Bob, zoom back out  I asked the cameraman to frame a closeup of Mary Ann so I could insert a shot of her "listening" while Bob was talking. She didn't understand at first what I was doing, but Bob explained to her that she should nod and smile during this "reaction shot." We got lucky; during the few seconds we were inserting Mary Ann live over the previously recorded video, she gave us a nice silent laugh. I don't remember what else went into the presentation. I assume the Marion Today folks said hello to Anderson, and we may have brought in the mayor and the sheriff and a sports commentator, and I was probably on camera as well. Our chief engineer Cliff Dice and I spent all day assembling the piece. I understand that when it was shown in Indiana, it was well received. Of course, we never revealed to the Hoosiers that in Marion, we didn't really have a color studio. 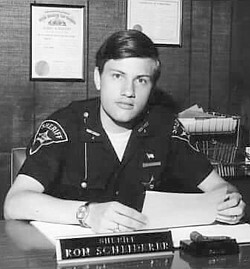 I grew up in the village of Richwood, Ohio, in the 1950s. To our family, the "big city" was Columbus, 45 miles away, with its television stations and big department stores like Lazarus. But we traveled to the state capital only on special occasions. 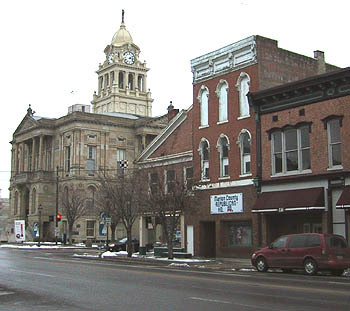 More often, we went 15 miles in the other direction to the smaller city of Marion, with its one radio station and small department stores like Uhler's. The Uhler store was downtown on the corner of Center and Prospect. Its multi-story building still used the technology of the late 19th century. For example, there were no cash registers. When you made a purchase, the clerk put your cash and sales slip into a metal cylinder and whisked it up to the office via pneumatic tube. In a minute or two, the cylinder would come back down with your change and receipt. The building also had an elevator, operated by a man sitting on a stool inside the car. He opened and closed both sets of doors (a folding gate on the elevator car and a solid pair of doors on each floor) and pulled the levers to make the elevator go. My mother and I rode the elevator up to the fourth-floor office of Dr. D. W. Brickley. This "Eye Ear Nose & Throat" specialist always wore on his forehead one of those concave mirrors with a hole in the middle, the purpose of which I never understood. Dr. Brickley oversaw the removal of my tonsils in 1953. Then, as I grew up, he prescribed a new set of eyeglasses every six months for my progressing nearsightedness. We'd take the prescription up to the next floor to get the glasses made at the White-Haines Optical Company. 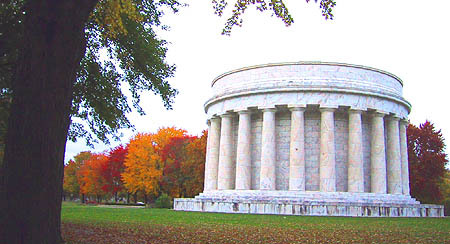 With a population around 30,000, Marion had been the home of Warren G. Harding. It's the site of his Presidential memorial. 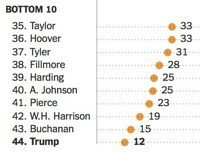 2018 UPDATE: During the Nixon adminstration, many Marionites grudgingly admitted that Harding might have been the worst President ever, mostly because of his Teapot Dome scandal. Current experts have re-evaluated the list. Back in Richwood, my father owned a small Chevrolet dealership. If our service department needed a part that we didn't have in stock, we'd check with other Chevy dealers. Midtown Chevrolet in Marion often would have the part, so we'd send someone to pick it up. Sometimes my mother and I would be the ones to run this errand. I remember riding back to Richwood alongside a slightly greasy new tailpipe, which was wedged between our car's windshield on one end and the rear window on the other. 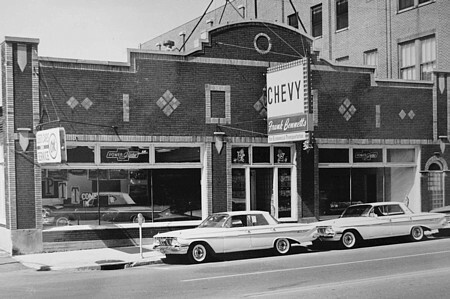 Midtown Chevrolet was located on South Main Street, near the top of a hill that slopes down to Columbia Street. Local competition in the Chevy-sponsored Soap Box Derby was held on that hill. Later, the business changed hands and became Frank Bennett Chevrolet. When I got my first job in 1970 with Marion CATV, I found myself right across Main Street from Frank Bennett's dealership. The cable office and studio were in what was then called the Lord Sullivan & Yoder building. In this picture taken 30 years later, it's the white-fronted building on the left. I had been working there for only a few months when, like my father's business several years before, Frank Bennett Chevrolet burned to the ground. From the roof of the LSY Building, I took a Polaroid photo of the ruins to use in my newscast that evening. Unlike my father, Frank Bennett didn't rebuild at the same address. The new Chevrolet location was on Mt. Vernon Avenue on the eastern edge of the city. I remembered that the burned building had been the home of Frank Bennett Chevrolet from 1960 to 1965, when I was in high school, but I forgot that by the time of the fire it had changed hands. "My father Frank was the owner of Frank Bennett Chevrolet from 1960 until he passed away on February 1991. My dad built a new facility at 1065 Mt. Vernon Avenue and moved from 203 South Main Street in the summer of 1965. After dad moved out, MARCO Motors, a Plymouth dealer, rented the facility and operated until the building caught fire, apparently while it was being robbed. 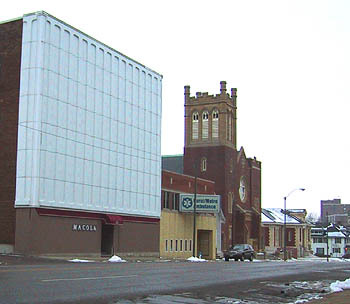 The building, which was located between the Marion Chamber of Commerce and the General Telephone building and across the street from Marion Lincoln-Mercury, was never rebuilt, and the empty lot remains until this day. Dads business was not affected by the fire as he had moved out to the new facility by then." Over the next decade or two, most of downtown Marion's other businesses followed Bennett to that commercial strip, or to another on the south side of town. Even the post office abandoned the central city. Now, as in so many county seats, there's not much left downtown except the courthouse. While I was working at TV-3 in Marion, I occasionally shot Super 8 movie film. Here are some images from those home movies. 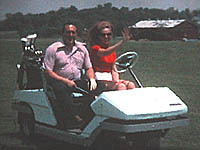 On June 3, 1972, the new Whetstone Country Club held its grand opening. I recorded audio cassettes and shot Polaroids and movies, then put it all together for a 15-minute TV special  in black and white, of course. 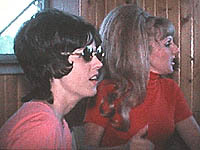 On hand to interview the club's owners were the hostesses of our morning show, Judy Rock and Sandy Park (middle picture). Sandy shared some laughs with Max Ross, the former football coach and county sheriff who had been hired to manage the new golf course. Part of an interview from the special. In order of appearance: Max Ross, Sandy Park, Paul Ludwig, and (mentioning the stainless steel pool) Judy Rock. 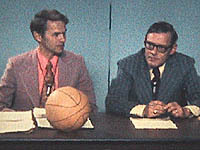 Among the guests was Jack Rubins (in the purple shirt below), who as the manager of Marion CATV had hired me two years before. 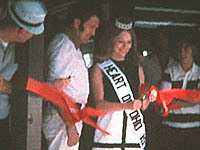 And the reigning Miss Heart of Ohio cut the ribbon. 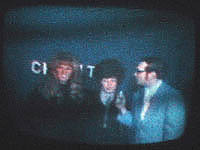 The frames below were photographed off a TV set during the playback of the program. That's yours truly opening the show and introducing our stars, the ubiquitous Sandy and Judy. Back in the studio, local insurance man Joe Galloway (right) talked every week with the Marion Catholic and Harding High School head coaches, who showed 16mm game films. The only set decoration was the yellow basketball I had brought from home. It was barely inflated so that it wouldn't roll off the table. For our morning show, Marion Today, the blue wall panels at the rear of the studio were hidden by dark-green curtains. The tops of these curtains were nailed to boards, which were in turn fastened to wooden coathangers, which hooked over the top of the wall panels. One of my many duties was staff announcer. On one audio cassette I recorded the morning sign-on and the voice-overs to play over live theme music from the studio. Judy and Sandy's set was furnished by a local furniture company in exchange for on-air mentions. Since there was room for only the one couch, they sat side by side. Here they call a cable subscriber in February 1974 to ask if the subscriber knows how much is "on deposit" for the big jackpot. If we needed to interview two guests at the same time, one of the hostesses had to leave temporarily so there would be enough room on the couch. We didn't have the space for guests to make a grand entrance as on the Tonight Show. Whenever people and microphones on the set had to be rearranged, we cut away by turning the cameras to pianist Judy Dendinger at the end of the couch. 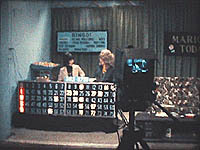 Following Marion Today, Bingo originated from the studio. Our hostesses merely moved over a few feet. And that was where I left them when I left Marion and those '70s shows behind.